In this article, we’re going to take the pulse of the market of trampolines for adults. In order to get a clear glimpse at this niche, we searched for specifications, qualities, and possible weaknesses of the entries. The core features that stand at the basis of each of these entries are a high weight capacity, sturdiness, and flexibility for extra bounciness. While there are many trampolines in the market, not all of them are made specifically for adults. These need to have adequate space, have enough weight capacity, and be sturdy to withstand the pressure for many years to come. That’s why we’ve looked for the best trampoline for adults and compiled a top seven list. Let’s start with the Octagon Magic Circle trampoline. 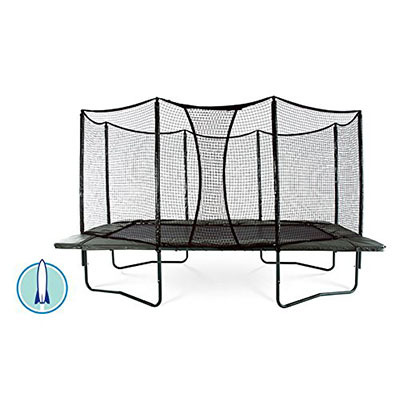 If you’re looking for a trampoline that can provide fun for both adults and children, this is a great model to consider. It is very sturdy and uses an integrated system. This way, there isn’t any space between the cage and mat (for extra safety). There is also foam on the rods holding the enclosure for cushioning. The standout feature of this trampoline is its 450-pound weight capacity. – The dimensions are 192 x 192 x 120 inches. – The assembled weight is 322 pounds. – Its weight capacity is 450 pounds. – It’s for ages 3 years and up. – Price range is high. Many safety built-in features make it a great buy for the family. It has a high weight capacity meaning that adults can enjoy the trampoline without damaging it. Few customers experienced missing parts in their order. On the other hand, this can be a common problem with buying products online. The Octagon Magic Circle is a flexible trampoline that’s fun for both adults and the whole family. We ranked in seventh on our list because of the high price point. Another great alternative to the Octagon Magic Circle is the JumpSport AlleyOOP VariableBounce. What sets this trampoline apart is their VariableBounce technology. It is supposed to help absorb the shock of the bounce while maximizing the bounce of the trampoline. It’s great for both adults and the rest of the family due to some features like the rest zone pads (for taking turns). – The dimensions are 144 x 144 x 35 inches. – The assembled weight is 343 pounds. – Its weight capacity is 295 pounds. – For all ages (younger children need supervision). Their technology actually does make a difference in the shock absorption and bounce offers. According to customers that have owned it for an extended period, it is very durable and will last several years. It is quite expensive but you do get what you pay for. This is a quality trampoline that both adults and children will enjoy. The safety features and construction are solid. We ranked this trampoline sixth on our list because of the high price point. The ExacMe Trampoline is the best trampoline for adults if you are operating on a smaller budget. It performs well and the structural material is very solid. However, it doesn’t have the essential safety features that make it safe for kids. – The assembled weight is 290 pounds. – Its weight capacity is 398 pounds. – Price range is low. 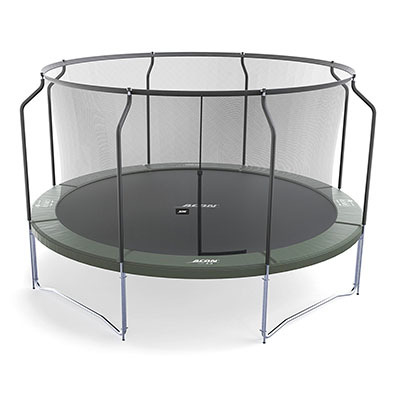 The trampoline performs well, has a sturdy foundation, and offers plenty of space. It’s a great value for the price, especially for the space you get. The enclosure isn’t of the best quality. It’s not secure enough and seems to wear out fairly quickly. Overall, this trampoline offers an incredible value. It performs well for the price you pay. 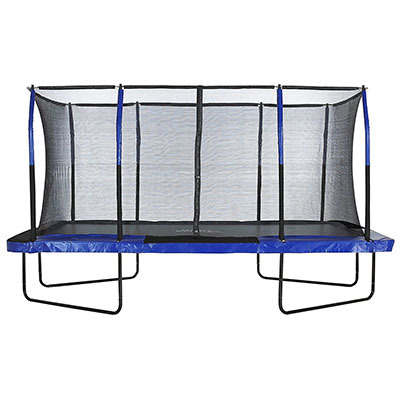 It has the perfect weight capacity for adults and provides a lot of room for jumping. We ranked this trampoline 5th due to its lack of safety features. The Upper Bounce stands out from the list because it is a rectangular trampoline. This provides enough space for many people to use the trampoline at once. It also has many safety features like a no-gap enclosure, dual closure net, safety pads on the sides, and curved poles for stability. It is also made of heavy duty material. – The dimensions are 68 x 5 x 23 inches. – The assembled weight is 311 pounds. – Its weight capacity is 500 pounds. – For ages 3 and up. – Price is in lower mid range. The trampoline is made of heavy duty material. The rectangular shape offers a lot of room and is backed by a high weight capacity. Some customers report that the threading isn’t secure enough and will rip over years of use. This trampoline is a great choice for both children and adults. It has a high weight capacity to match the space you get. We ranked it 4th because the safety features and the construction measures up to some of the best trampolines for adults that tilt toward the expensive side. If you’re looking for a big trampoline backed by quality construction and strong safety features, look no further than the AlleyOOP PowerBounce. It has many unique safety features like super thick pads, a safety net backup system, and overlapping doorways to protect against accidental fall-outs. – The assembled weight is 650 pounds. – Its weight capacity is 800 pounds. – For ages 6 and up. 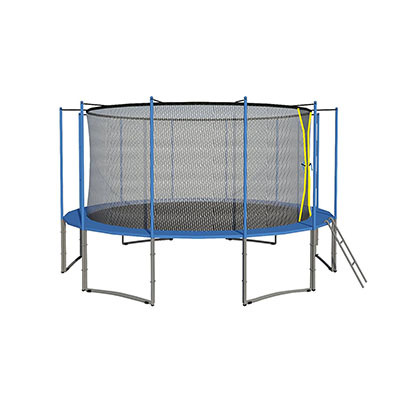 The trampoline offers a lot of space, many patented safety features, and provides a strong bounce. The company offers a lifetime warranty which is unheard of when it comes to trampolines. It is very expensive even among the higher priced models in the market. This trampoline is a great choice if you are looking for one of the best trampolines on the market and don’t mind spending a premium price. The fact that the manufacturer offers a lifetime warranty makes it a great value. What’s special about this Acon Air Trampoline, is that it was built for performance. This may be the best trampoline for adults looking to use the trampoline for their fitness routine or to practice their jumps. It has a high-quality enclosure that a strong foundation. The trampoline is mainly designed for a single adult yet has no weight restrictions for one person. – The dimensions are 14 feet (diameter) x 35.8 (height) inches. – The assembled weight is 295 pounds. – Price is in the mid-range. This is the best trampoline for adults planning to use it for fitness and recreation. The construction and materials used are of high quality. 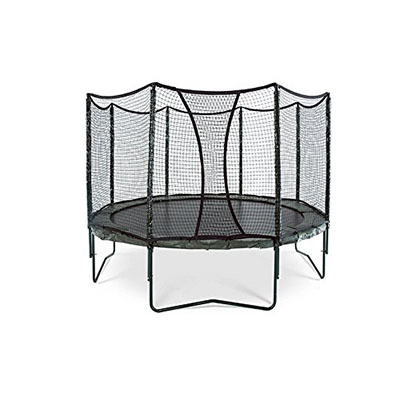 All replacement parts are available for purchase and the trampoline can withstand outdoor weather conditions. Not much space for more than one person but again, the trampoline is designed for a single adult from the beginning. The Acon Air Trampoline is perfect for one person. In terms of construction and material quality, it’s the best we’ve found on the list. It is also priced very well and is a great buy for fitness enthusiasts which is why it’s 2nd on the list. The SkyBound Stratos Trampoline is another model that is in the running as the best trampoline for adults. It rivals the Acon due to its quality of material, solid construction, and safety features. However, it has a smaller weight capacity, so it can be limited despite the fact that it offers more space than the Acon model. – The dimensions are 180 x 180 x 108 inches. – The assembled weight is 305 pounds. – Its weight capacity is 330 pounds. – Price is in the upper mid-range. 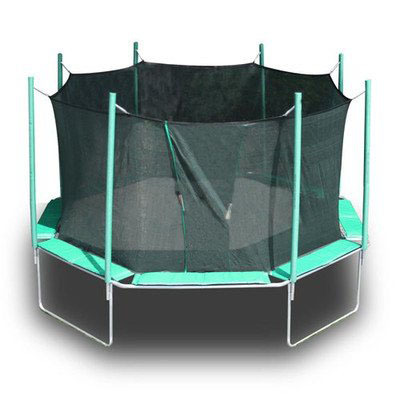 The trampoline is constructed well and uses high-quality parts. Enclosure design absorbs falls very well. It is priced exceptionally well compared to other models that offer similar quality. The weight capacity is sufficient but not enough for two large adults. This is an all-around quality trampoline. Be sure to choose the right size and keep the weight capacity in mind before you purchase. We ranked this trampoline 1st for its high-quality construction/material, solid design, and outstanding performance. Choosing the ideal model for your needs is the fun part. Where it gets hard is the moment the bulky package reaches your door. Getting the hang on how to assemble trampolines might take you half a day. You’ll need additional tools such as a power drill, spring puller, hammer, and screwdriver. Nonetheless, you should find out which of these tools your purchased package contains so as not to spend time collecting unnecessary materials. When getting to the actual assembly part, the best strategy is to start with the frame and legs. Afterward, you’ll add the mat followed by strings and protective pad. At the end, it is important to test the trampoline before inviting the whole family for trying out the new toy. Overall, there isn’t a single best trampoline for adults. The trampoline you’ll end up getting will depend on various factors. You’ll want to consider the space, weight capacity, performance, safety features, and cost. We recommend you think about what your needs are and go through the list carefully. If you’ve tried or own any of the trampolines on our list, tell us your thoughts. Which products do you feel are better than others? Which ones are you satisfied with? Let us know. I find it funny that so many adults think that they are too old or too big to jump on trampolines. That is simply not at all true and this link most definitely proves that. You don’t stop liking stuff that you liked when you were a kid just because you grow up. Thank you, D’Arcy, for your wonderful viewpoint on trampolines. Adults especially need a quick way to remember how fun looks like, and what’s better at that than a bouncy mat? Don’t forget to follow our Top Trampolines Tested Facebook page to stay tuned to fresh trampoline reviews and guides. 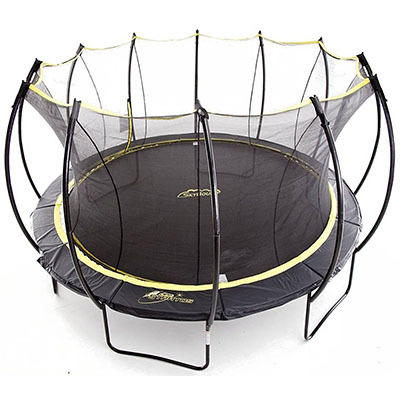 The ExacMe Trampoline is fine to get if a teen or an adult plans to jump on it, and it is cheap. However, don’t consider getting this one if you have small kids because it is not safe for them at all. Hey, Rocco! Appreciate your feedback. That’s right, kids will enjoy better smaller products with bright colors such as bounce houses. Follow our Facebook page to get fresh reviews on this type of trampolines live! I am torn here. My son is 19 and is severely autistic. I know he would absolutely do well with a trampoline but my worry is are any of these adult ones truly safe like kid ones are? He is like a 6-foot kindergartener so this is why I am concerned. Joanna – I would say yes, since they all have a safety net. However, do talk to your pediatrician or psychiatrist before making any purchase! The Octagon Magic Circle is a perfect option for our active family of 4 because this will keep all of us busy while we are bonding. We are small framed people so I think we may be able to fit everyone together which would be fun. This is very helpful. I could use some exercise, and I will not go to the gym because I hate the atmosphere. These adult trampolines look great, and it is now a matter of narrowing it down. My teenage daughter would enjoy it too.